Sir Walter Ralegh's account of his 1595 expedition to the Orinoco in search of the fabled empire of El Dorado was an immediate publishing success and is one of the most important pieces of Elizabethan travel literature. This edition presents, on facing pages, the annotated texts of a previously unpublished copy of Ralegh's fair manuscript draft of The Discoverie of the Large, Rich, and Bewtifvl Empyre of Gviana and the subsequent printed versions, and demonstrates very clearly how Sir Robert Cecil and Ralegh's few other serious backers induced the reluctant author to alter his manuscript for publication. Lively tales of Amazon women, drinking bouts and swash-buckling adventures, which would have fascinated armchair travellers, were firmly deleted. The focus of his appeal to investors was shifted from an ephemeral golden empire to actual gold mines to which, as his manuscript shows, he had originally paid little attention and for which he had very little evidence. In effect Ralegh was forced to develop a strategy to mediate between what he believed to exist and what he actually found, between his dreams of what he might accomplish and the real obstacles which faced him in the field, between his creative, imaginative response to his recent journey and the need to present it in such a way as to encourage others to undertake another such journey with him. 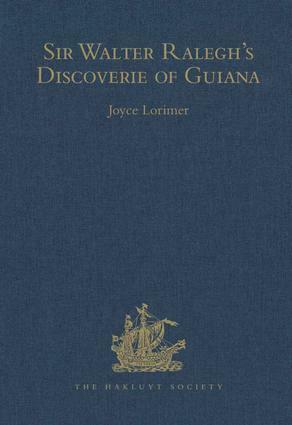 The materials collected in the appendices indicate that while men like John Ley were immediately inspired to explore Guiana, bringing back fabulous tales of monstrous peoples, Ralegh lost interest until he saw a chance to free himself from imprisonment in the Tower by inventing stories of Orinoco gold mines which he had never mentioned in either the draft or the published version of The Discoverie. Joyce Lorimer is Associate Professor in the Department of History, Wilfrid Laurier University, Canada. She has previously edited English and Irish Settlement on the River Amazon, 1550-1646 (Hakluyt Society, 1989), and Settlement Patterns in Early Modern Colonization, 16th-18th Centuries (Ashgate/Variorum, 1998).